This is the author page for J.I. Rodale. For books that he did not write, but that were published by the Press he founded, please see Rodale Press. Please do not combine the two. Thank you. 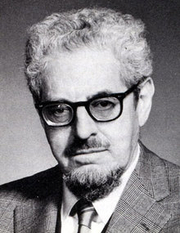 J. I. Rodale is currently considered a "single author." If one or more works are by a distinct, homonymous authors, go ahead and split the author. J. I. Rodale is composed of 10 names. You can examine and separate out names.